Well, I was born in Rhodes Harbour, Greece and promptly got on a ferry to Symi. Beautiful place it is too. Here are a few snaps of where I’ve been…I even made friends with a snorkelling cat, although she seemed half asleep so not much conversation had there. Anyway, I managed to escape from my owner and am now with another lovely lady called Gabby at a hotel called ‘iapetos village’. Gabby has promised me that she will be sending me to America!! (that’s me in the bag with Gabby – much too hot for that kind of treatment…) I do hope I get there…always wanted to see the Big Apple. Hope you like my attempt at artistic shots? Thanks to Camera 166, follow its continuing journey over at the camera tracker page. Metro article about The Disposable Memory Project, originally uploaded by webponce. 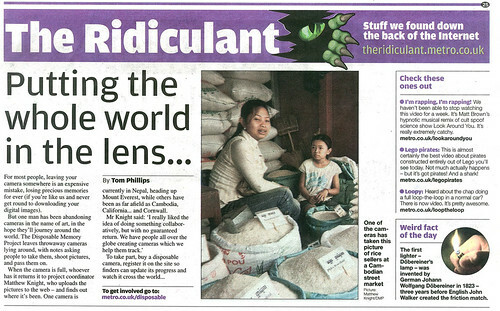 Apologies for taking our time in posting this – but here is the article which recently featured in the UK newspaper The Metro. You can click through the image above and read the full version at flickr. We’ve had a great response from people who’ve seen the article in the Metro from all around the UK, and the article featured one of the images from Camera 47. If you’ve been following the project, you’ll know that one of our cameras has already made its way to Everest Basecamp with Monika A. a few months ago, and we’ve had a number of great suggestions from people as to where we could drop cameras for the coveted ‘Camera 32‘ title. One of the possible Camera 32 entrants is Sally R. who will be travelling to the Arctic later this month, with a couple of our cameras in tow. We’re going to be following Sally’s trip to the north of the planet via the blog and camera page once it has been setup. Here is a little bit on Sally’s trip. We will fly via Copenhagen to Greenland where we are being airlifted by helicopter to the ice sheets to camp out and do hydrological field work. 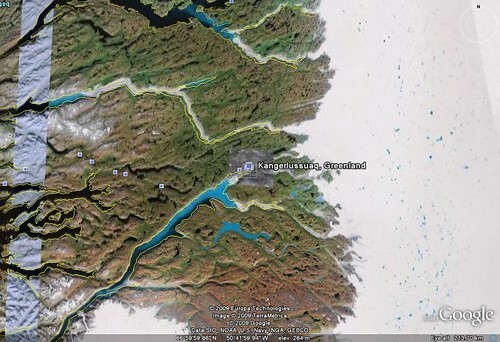 Along the way we will be staying at an international scientific research station in the Arctic, and also a youth hostel for a few days at the end of the trip in Kangerlussuaq in West Greenland while we do a bit of kayaking, hiking etc. It was here that I thought there would be good opportunity to leave/pass on cameras to interesting people. Really looking forward to hearing from Sally on her journey, and a little more about what she does over the course of the next few months. I have read about your project in a local freesheet. Straight away I thought it is an amazing idea. People move about and see things that can be never passed onto someone else, they can never share the experience with anybody- the disposable memories…I work in a photoshop and see hundreds of photos every day; photos that have little soul and matter to few people. Your project brings back the uniqueness of every experience captured randomly and shared with those who believe their memory will return and will be seen by many. Thanks Domi, you sum up the project so well, and we’re really glad to have you as part of our community. Looking forward to hearing about your camera!